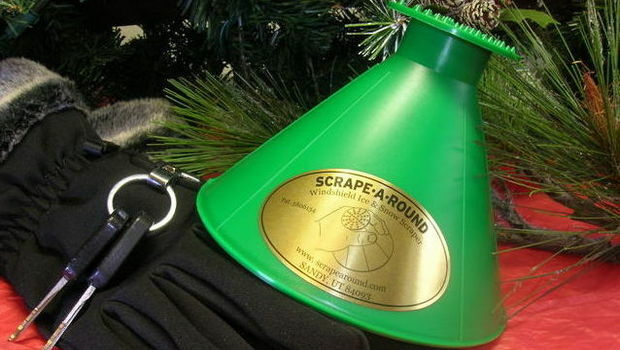 If you're tired of scraping your windows the old fashioned way, then join the Scrape-A-Round movement. You will secure your family's safety, access new gift ideas and scrape your windows cleaner in half the time with the world's best windshield ice scraper. allows the scraper to conform to the window curvature! Find out more information: http://www.scrapearound.com/ 18" of ice scraping surface. The comfortable grasp provides relief for the arthritic or carpal syndrome sufferer. Direct pressure to the window, no pressure lost through the ice scraper! The circular rotational motion of ice scraper. Double ice scraper action, leading edge and trailing edge. Multi functional, remove the cap and it doubles as a funnel. This scrapes windows frost and ice free in half the time! Makes the perfect gift for the Holidays! Even better, my readers get to save! Get FREE Shipping at http://www.scrapearound.com/ Use code LU8FBEZREU2 at checkout.